So Adorable! Tried These Bunny Cakes On A Stick Yet? We drove up to East Delhi in search of home bakers who make adorable cakesicles. A two-year-old baking venture, Pash is the combination of the names Shachi and Parul (they’re sisters), who run the show here. Wondering what cakesicles really are? Well, think of them as cake pops on sticks. On the outside, they’ll remind you of our childhood crush aka Choco Bar and on the inside, they’re like the gooey-est brownie you’ve ever had. Till a few years ago, the duo was loved by nearby bakeries who’d stock up their cakes. “But, where’s the fun in making something that looks the same every day?” says Shachi. After a short while, when boredom set in, they decided to go back to doing only individual orders. Their reasoning: “It’s always more creatively satisfying to work with people who make us push our limits and try something new,” Shachi adds. Of course, Parul’s background as an interior decorator and all-consuming love for shapes and forms, comes in pretty handy when they experiment. This has meant that cakesicle orders for birthday parties, baby showers and merry get-togethers have poured by mere word of mouth. 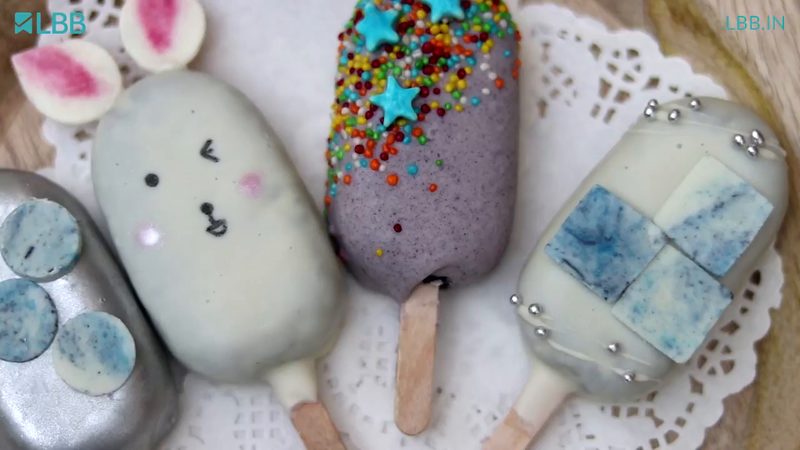 Over the course of time, they’ve done cakesicles with a moustache, babies, shaped like bunnies and carrots, with a marble finish, with sprinkles and stars and dipped in chocolate and laden with edible hearts. You will have to give Shashi and Parul a day’s notice to get the cakesicles delivered home. In case you want more than 50, you’ll have to give them a 2-day window. While the wait is a tad bit long, we promise it'll be worth it. Whether you like vanilla, chocolate, dark chocolate, chocolate truffle or even red velvet, the folks at Pash can create cakesicles with a design of your choice. Want a quote or bae’s face on it? Hey, that’s possible too! You can check them out on Facebook and order away. They mostly deliver across Delhi and NCR and the desserts travel in an Uber (no, they don’t charge an extra delivery charge yet). Each cakesicle (depending on how much detailing goes in), can cost INR 150-250. Want to try Pash’s other desserts? Their cakes in jars are a hit. Plus, they’ve also recently whipped up elaborate wedding cakes.